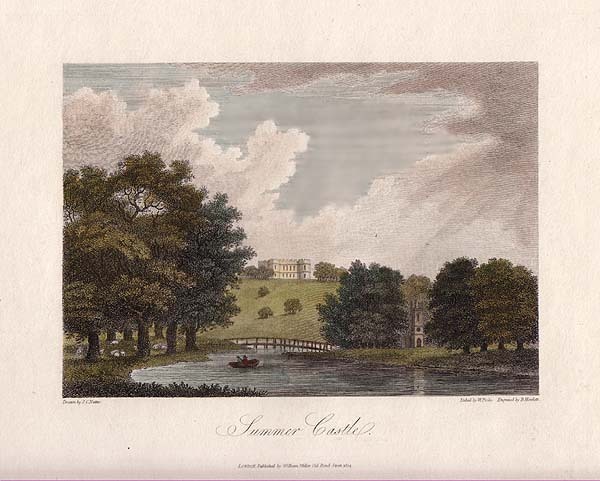 The South view ofSomerton Castle, near Lincoln Heath. An antique line engraving after Samuel and Nathaniel Buck. Printed in London by Newbery and Carnan, between 1765-1770 from A Description of England and Wales' with later hand colouring. An antique line engraving by E. Challis after T. Allom. Circa 1835 with later hand colouring. Belvoir Castle the Seat of the Duke of Rutland in Lincolnshire. An antique line engraving by W. Taylor after J.P. Neale. Published in 1831. An antique line engraving after J.P. Neale. Published in 1831. The colouring is later. South View of Somerton Castle. An antique etching by W. Poole, engraved by B. Howlett after J.C. Nattes. Published in 1799. Later coloured by hand. East view of Tattershal Castle. East View of Tattershall Castle. An antique line engraving by J. Shury after T. Allom. Published by John Saunders in 1834. Later coloured by hand. An antique line engraving by E. Challis after T. Allom. Circa 1840. Later coloured by hand.